We’re talking about great gifts for husbands, boyfriends, dads, grandparents, coaches and kids . . . as well as some items you might want to put on your own wishlist. We’ve got recommendations on travel, books, candles, and skincare stuff, as an assortment of unique gifts for the younger set. 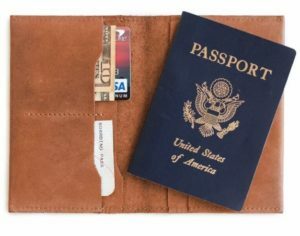 The ABLE Alem leather passport holder is a great gift for anyone who travels a lot, and it’s made by artisans in Ethiopia who are earning a fair wage. Pinch Provisions Travel Set has everything you could need in a tiny little bag. It’s great for emergencies or to have on hand in case your luggage was lost. The Herschel Backpack is a classic. It’s canvas with leather straps and a simple, masculine vibe. Away has the perfect gift for everyone on your list because they make suitcases for the way we all actually travel, with features like an ejectable TSA-approved battery or a built-in front pocket, and they come in a range of colors and materials to suit your travel style. Also, every suitcase comes with a 100-day trial that gives you plenty of time to decide on the perfect size and color—which also means you can gift with confidence. For $20 off a suitcase, visit awaytravel.com/selfie and use promo code SELFIE during checkout. Who doesn’t love a Roku stick? It can turn any tv into a smart tv, and gives access to Netflix, Hulu, Amazon Prime, and more. It’s a great option for cutting cable, and a perfect gift for young adults. A Home Movie Projector is a fun gift to turn your living room into a big-screen movie room, and for only $62 it’s a lot of wow factor for not a lot of money. For anyone who has multiple tech devices this Eco Bamboo Charging Station is a great way to charge multiple devices at once without cords getting tangled, and the bamboo gives it a softer look so your charging station isn’t an eyesore. The Amazon Echo is a great gift for anyone. It can play your morning news, operate your Sonos speakers, keep your shopping list up to date – both of us have these in every room. For the person who is constantly losing their keys . . . the Tile Mate Key Finder is a practical and thoughtful gift, especially for dads. Patagonia has great jackets and puffers and we love their environmental impact: with the 10 million tax credit it received from the Trump administration, they donated all of it to non-profit environmental groups! Krochet Kids is one of our favorite companies because their sewing program empowers at-risk women in Uganda and Peru. 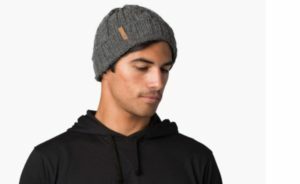 They have a great collection of cozy beanies and super-soft t-shirts for men. 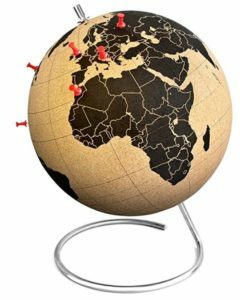 This Cork Desktop Globe allows you to put pins into the cork to mark places you’ve been or bucket-list destinations. This Hookey Ringtoss Game is a great alternative to a dart set. Designed to look like a Marshall guitar amp, the Marshall Kilburn Bluetooth Speaker is a fun gift for music lovers. We love that Man Crates offers a jerky advent calendar and all kinds of gift crates for men, from whiskey to grilling. Osmia Black Clay Facial Soap is a great clean soap for all skin types. If you love a man with a beard, Crux Beard Oil has a classic herbal scent and is formulated with all-natural ingredients. Give this Shiatsu Massage Pillow to someone you love and then promptly steal it. Trust us. Ursa Major has great stuff for guys, from face wash, face wipes, shave cream, to morning mojo soap. We love this 31 Bits jewelry-making kit using beads that Ugandan artists recycled from paper. This Star Projection Light from Amazon casts a beautiful starry college across the entire ceiling. It’s peaceful and soothing, and a great bedtime ritual. Reinforce the idea of gender equality with kids of both genders with the Mudpuppy Little Feminists Puzzle and Goodnight stories for Rebel Girls. Check out this fun Em and Liz Subscription Box full of stuff girls love. Consider giving your kids a Stitchfix subscription. Kristen’s kids have loved the stuff they get tailored to their own style preferences. Sarah has to confess that the new Barbie Dreamhouse is the item little girls are pining for this year. And speaking of new releases, Super Smash Bros Ultimate released on December 7th. How hilarious is this Shakespeare Insult Generator? The Craftster’s Sewing Kits meet our criteria for crafts: kids can do it independently and it takes a lot of time to complete. Gummy Bear Lights are a fun easy gift for kids room. For slime enthusiasts, Crazy Aaron’s Thinking Putty is non-toxic silicone, never dries out & is easily removed from solid surfaces, and is a great product for fidgety kids. We also have a great offer from Canvas People, a company that prints your favorite photos on canvas for really unique and beautiful prints. We have a special code that you can use to get an 11×14 Canvas People print FREE. This is a $69.99 value. All you do is pay the shipping and handling. Visit CanvasPeople.com, upload your photo, and enter this special code: SELFIE. Buffy makes comforters that are better for you and the earth, using skin-friendly eucalyptus fabric and fluffy fill made from 100% recycled water bottles. Buffy’s hypoallergenic materials shut out dust, mold and mites – preventing nighttime breathing of harmful allergens. The inside fill of each comforter is made from 100% recycled, bpa-free water bottles that are transformed and given a second life as a soft, fluffy fiber. Buffy believes bedding is personal, so they offer a complimentary trial. Try a comforter in your own home for 30-days. If you don’t love it, return it free! For $20 off your Buffy comforter, visit Buffy.co and enter the promo code SELFIE.